Unfortunately, many of the issues plaguing oceans worldwide have only gotten worse since last year's event. A recent report by the Marine Conservation Institute criticized the United States' lackluster protection of coastal ecosystems, overfishing continues to deplete wild fish populations and studies show ocean acidification is still threatening certain regions. Yet conservation efforts are gaining some steady support. Secretary of State John Kerry convened a group of "ocean experts" earlier this week to discuss conservation, saying the State Dept. was "committed to addressing threats including pollution, overfishing, and ocean acidification," in a press release. The event comes shortly after the White House released the final version of a landmark National Oceans Policy in April, mandated by a 2010 executive order from President Barack Obama. the researchers discovered plastics were the most common seafloor trash. The mention of ocean pollution usually triggers searing images of birds and turtles choked by bags, fasteners and other debris floating at the ocean surface. But thousands of feet below, garbage also clutters the seafloor, with as yet unknown consequences for marine life, a new study finds. Distribution of marine debris observed in Monterey Bay (N=1,149). MBARI ROV surveys over the 22-year study period are shown in red. The relative abundance of trash was normalized by the amount of time spent searching the seafloor; the largest circles depict areas of trash accumulation which tend to occur on the outside walls of canyon meanders where high-energy water flow and erosion occur. The main study grid (upper inset) extended to the abyssal plain and included Davidson Seamount, about 130 km to the southwest. "It's completely changing the natural environment, in a way that we don't know what it's going to do," said Susan von Thun, a study co-author and senior research technician at the Monterey Bay Aquarium Research Institute (MBARI) in Monterey, Calif.
For the past 22 years, MBARI researchers have explored the deep ocean seafloor from California to Canada and offshore of Hawaii. Video researchers tagged every piece of trash seen during the deep-sea dives, cataloguing more than 1,500 items in all. Sparked by a recent study on trash offshore of Southern California, scientists at MBARI decided to analyze the database of ocean debris they had gathered. The results were published May 28 in the journal Deep Sea Research Part I: Oceanographic Research Papers. 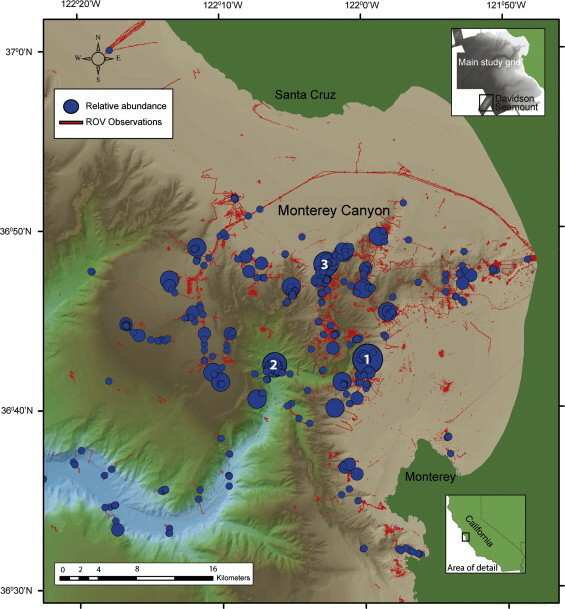 The relationship between rugosity and debris distribution in Monterey Canyon. MBARI ROV surveys over the 22-year study period are shown in blue. The distribution of natural debris (drift kelp, wood) in Monterey Bay is indicated by the blue circles; the distribution of anthropogenic marine debris is indicated by the orange triangles. The red box outlines a “clean” section of the canyon. "Unfortunately for me, I wasn't so surprised," said von Thun, who works in the MBARI video lab. "I've seen plenty of trash as I've been annotating video." More than half of the plastic items were bags. A deep-sea coral living nearly 7,000 feet (2,115 meters) off the Oregon Coast had a black plastic bag wrapped around its base, which will eventually kill the organism, von Thun said. The second biggest source of ocean trash was metal — soda and food cans. Other common types of debris included rope from fishing equipment, glass bottles, cardboard, wood and clothing. Because most of the ocean pollution came from single-use plastic bottles and cans, von Thun and her co-authors hope the research will inspire more people to reduce, reuse and recycle. "The main way to combat this problem is to prevent all this stuff from getting into the ocean to begin with," von Thun told OurAmazingPlanet. "We really have to properly dispose of items, reduce our use of single-use items and recycle." The arrival of shoes, tires and fishing gear in the deep sea is a big change for deep-sea marine life. Their environment is mostly soft mud, so hard surfaces are rare, and sea creatures colonize the trash, von Thun said. For example, MBARI is following the effects wrought by a shipping container that fell overboard into Monterey Canyon in 2004. But even a discarded tire can make a home for certain sea creatures at 2,850 feet (868 meters) below the ocean surface. In Monterey Canyon, a deep, winding gorge offshore of Central California, trash collects in the canyon's outer bends or in topographic highs or lows, just like in rivers on land, von Thun said. Currents also trap trash behind obstacles, such as dead whale carcasses. "We think the canyon dynamics and the currents are actually helping to distribute the plastic and metal to deeper areas," von Thun said. When a handful of retired homeowners from Osborn Island in New Jersey gathered last month to discuss post-Hurricane Sandy rebuilding and environmental protection, L. Stanton Hales Jr., a conservationist, could not have been clearer about the risks they faced. “I said, look people, you built on a marsh island, it’s oxidizing under your feet — it’s shrinking — and that exacerbates the sea level rise,” said Dr. Hales, director of the Barnegat Bay Partnership, an estuary program financed by the Environmental Protection Agency. 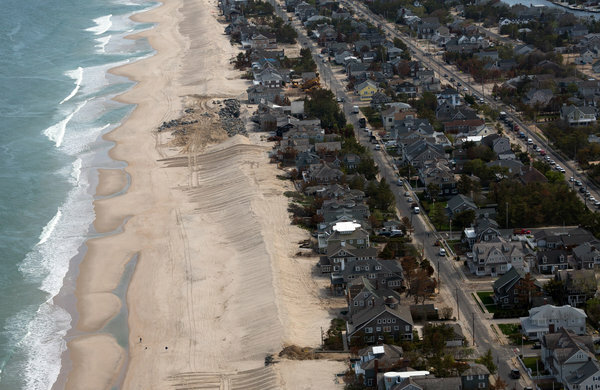 An aerial view of beachfront homes in Mantoloking, N.J.
Damage to the coastline was severe. In New Jersey, 94 percent of beaches and dunes were damaged, with 14 percent suffering a major loss of dune vegetation and beach erosion of 100 feet or more; 43 percent were moderately affected, losing 50 to 100 feet of beach, according to an assessment by the American Littoral Society. Thomas Herrington, a professor of ocean engineering at Stevens Institute of Technology in Hoboken, estimated that on one stretch of coastline, 500,000 cubic yards of sand were lost in the storm. The beach from Bay Head that extends north to Sandy Hook dropped six to eight feet vertically and eroded landward 100 to 150 feet horizontally, he said. 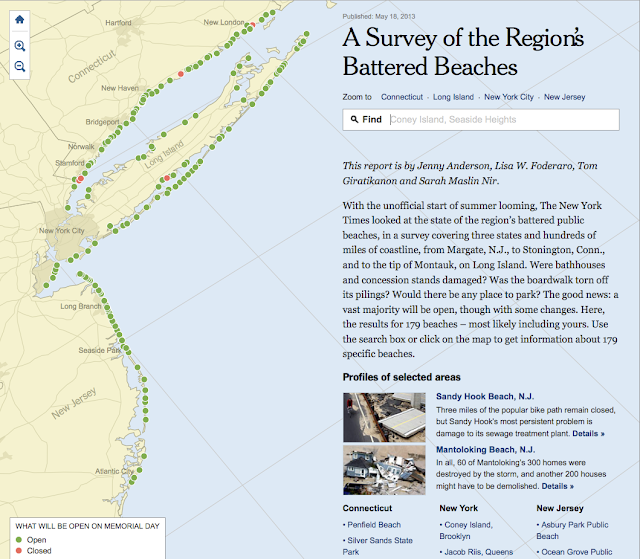 In New York Harbor, Raritan Bay and Jamaica Bay, a quarter of the beaches and dunes lost 50 to 100 feet of beach to erosion; on Long Island Sound, about 28 percent faced similar damage. The Army Corps of Engineers will replace 27 million cubic yards of sand along the entire coast to restore and build “engineered beaches” in an effort to protect the homes and communities behind them, said Chris Gardner, a public affairs specialist for the corps’ New York district. Many officials involved in storm recovery maintain that rebuilding after Hurricane Sandy will be different, incorporating the realities of climate change and rising sea levels. Some ocean engineers and coastal scientists are not so sure. “My fear is that the environmental damage from Hurricane Sandy is going to be long-term and will result more from our response than from the storm itself,” said Robert S. Young, head of the Program for the Study of Developed Shorelines at Western Carolina University. “There have been steps taken” to rebuild better, said Tim Dillingham, executive director of the American Littoral Society. Houses have been elevated, and in New Jersey there are discussions about bigger and better dune systems, he said. Massive beach nourishment projects will restore beaches but require expensive upkeep and affect ecosystems. Individuals and communities are racing to rebuild sea walls that hasten erosion. And federal taxpayers will foot the bill to rebuild communities that continue to be at risk. One developer recently went so far as to advertise 24 waterfront acres for sale. The ad acknowledges that the property “has historically been wetlands” — on which development is barred — but noted that the storm had filled it in with sand. The Army Corps said it would be mindful of advances in thinking about climate change. And agencies are striving to better prepare for storms. In April, the Sandy Rebuilding Task Force — which is focused on regional resiliency — required that those using storm recovery funds to rebuild had to take additional measures to reduce flooding risks. In New Jersey, tougher building codes and the Federal Emergency Management Agency’s new flood maps mean homes are being elevated and floodproofed. New York has committed to using natural infrastructure where possible. And New Jersey and New York are offering voluntary buyouts to homeowners in flood-prone areas: New Jersey will use $300 million of federal money to buy as many as 1,000 homes, while New York has committed an initial $197 million to buying what it hopes will be over 2,000 homes. In New Jersey, the goal is to target contiguous properties to restore floodplains. State officials said the effort was unprecedented — even if it applied to only a fraction of homes. “We’d have to buy out 200,000 if you wanted to move everyone from potential harm,” said Larry Ragonese, press director of the New Jersey Department of Environmental Protection. But in Washington, the impulse to dial back legislation that discourages development is percolating. There were efforts in Congress to delay the introduction of higher rates for federal flood insurance (they failed last week). Construction on a new section of the Ocean grove boardwalk continues on April 11, 2013. Ocean Grove, NJ, was denied FEMA funds for Hurricane Sandy restaoration because of the town's non profit status. At the same time, environmental groups have taken issue with Senator Barbara Boxer, Democrat of California, over certain provisions in the Water Resources Development Act, a $12 billion water infrastructure bill that passed the Senate last week, which they feel would weaken the environmental review process. In a statement, Ms. Boxer said the bill did not undermine current laws. “By setting deadlines while preserving the protections in environmental laws, we ensure a sound and timely decision is made,” she said. Not all of the environmental impact from Hurricane Sandy has been negative. Beaches that were flattened in places like Breezy Point, in the Rockaways, and Fire Island may provide unique nesting opportunities for the endangered piping plover. The fluff ball of a bird breeds between April and September. Sand dumped into some bays could aid eelgrass and clam populations — if boating advocates do not get it dredged. And at least one effort to restore wildlife habitats had the dual benefit of restoring the beach. In Delaware Bay, the Littoral Society worked with other conservation groups for months to restore and prepare 1.25 miles of shoreline in time for horseshoe crab spawning season. The storm destroyed nearly 70 percent of the New Jersey horseshoe crab habitat. The crabs are part of a complex food chain. Their eggs provide fuel to thousands of red knot shorebirds — an endangered species in New Jersey — as they migrate from Tierra del Fuego to the Arctic Circle. Through public and private grants, $1.4 million was spent to remove debris and lay down 32,000 cubic yards of sand. Last week, the crabs were spawning and the birds were feasting, Mr. Dillingham said. Any silver lining for grasses, crabs and shorebirds faces a fundamental threat: the human urge to restore the beaches. When Dr. Hales told the residents of Osborn Island that they should reconsider rebuilding, they countered that they wanted their children and grandchildren to enjoy the place that was so special to them. The importance to Europe of its oceans, seas and coasts should not be underestimated. They are key economic drivers that not only supply millions of jobs but also support industries that sustain and diversify the economy. The 'blue economy' now accounts for almost €500bn a year and provides 5.4 million jobs across Europe, and by our estimates could grow by as much as €100bn and 1.5 million posts a year if properly supported to do so. In an economic context in which sustainable growth is a priority, the maritime sector can make a difference. The European Union's 'Blue Growth' strategy, unanimously agreed by the Council of Ministers in 2012, seeks to harness the untapped potential in the maritime sector to boost the continent's competitiveness and create jobs. Policies such as Maritime Spatial Planning will accelerate investments in the blue economy by increasing the stability, transparency and predictability for investments in the offshore maritime economy. Two areas that stand to benefit from this, and best illustrate the potential that exists, are ocean renewable energy and blue biotechnology. As any glance at an atlas tells us, the ocean dominates the world. We need to continue to explore how this immense, but finite, resource can better contribute to the production of sustainable, renewable energy without having a detrimental effect on the environment. Offshore wind power generation is expanding rapidly and could meet 4 per cent of our electricity demand by 2020 – and 14 per cent by 2030. This would mean 170,000 jobs by 2020, and up to 300,000 by 2030, as against the current 35,000. Other offshore renewable energies - notably wave and tidal power - offer a more regular and predictable source of electricity than wind energy but are not yet so commercially competitive. Efforts to reduce technology costs, increase research and a shift from demonstration to operation will also help industry in the export market. Similarly, the largely unexplored biodiversity of our seas provides a high potential for innovation on two different fronts: the better understanding of marine and maritime resources and its biodiversity, and the more efficient exploitation of their economic and scientific potential. Marine biotechnology is the enabling tool that will allow translating this potential into real products and acknowledge. The 2007 action plan for the EU Integrated Maritime Policy specifically called for a scientific, evidence-based maritime policy and identifies blue biotechnology as one of the key enabling technologies and maritime economic sectors. Underpinning these two areas and the Blue Growth strategy as a whole is, indeed, the Integrated Maritime Policy. It seeks to ensure the development of a sustainable blue economy. The EU's explicit powers in fields like fisheries, the environment, transport, research, enterprise and industry enable us to provide funding and to legislate. It is also our duty to foster an environment conducive to achieving sustainable blue growth by maximising the potential and reach of ocean renewable energy; promoting blue biotechnologies and supporting the maritime sector up until 2020 and beyond. available in next NOAA update in the GeoGarage very soon. 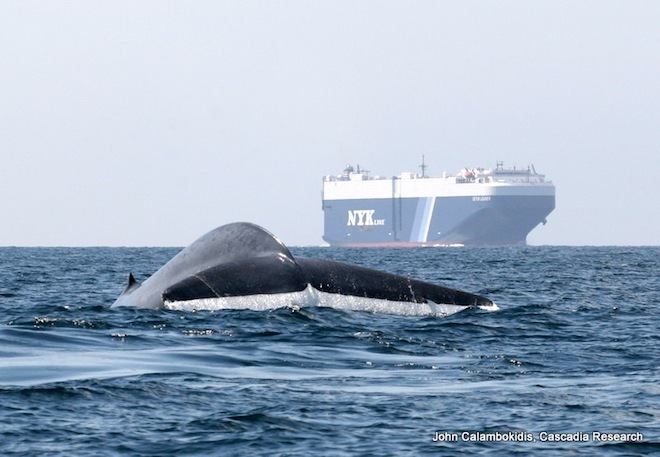 Whales near California’s largest ports are about to gain a bit more protection from the cargo ships with which they share their marine homes. In recent years, a record number of the seafaring giants have been hit and killed by ships sailing along the California coast, at levels that are unsustainable for already endangered populations. to minimize the intersection of whales and ship traffic. “Nobody wants to hit a whale, for the same reasons that nobody driving down the highway wants to hit a deer, or a possum, or a skunk,” John Berge, vice president of the Pacific Merchant Shipping Association, said on Tuesday at a panel discussion about the issue. Soon, the Pacific Merchant Shipping Association, which represents marine terminal operators and ocean carriers calling on west coast ports, will announce a large-scale project aimed at reducing ship strikes. Timed to coincide with the lane changes, the initiative will help fund whale monitoring flights over the Channel Islands, integrate and test a whale-spotting app, and facilitate the placement of whale observers on ships. The shipping lane changes come as ship strikes are growing in visibility and concern is mounting. In recent years, record numbers of endangered whales have washed ashore or been dragged into ports, wrapped around the bows of ships. But those whales are just a fraction of the total killed – the ocean doesn’t purge its fallen as often as they are taken. “I think it’s likely that less than 10 percent of ship strikes are documented,” said John Calambokidis, a research biologist with the Cascadia Research Collective, who has been studying ship strikes in the Pacific Ocean for decades. Between 1988 and 2012, at least 30 whales – humpbacks, grays, fins, and blues — were confirmed to have been killed or injured by ships near San Francisco [pdf]. A global database compiled and maintained by the International Whaling Commission documents hundreds more. And as whale populations rebound and move into new habitats, more whales are finding themselves in the paths of busy maritime traffic. With ship densities unlikely to decline any time soon, and whales being difficult to relocate, scientists, conservationists, and the shipping industry are working on ways to minimize the intersections of the seafaring giants. Starting Saturday, ships sailing through four marine sanctuaries off the California coast will be confined to narrower, more predictable paths, which should reduce the risk of colliding with whales and smaller fishing vessels. Near San Francisco, there are three designated routes leading into and out of the Bay. All three approaches – one each pointing north, west, and south – are being extended farther from shore. The extensions, particularly to the western lane, are important steps toward protecting the whales that congregate near the continental shelf drop-off. “That, in terms of the lane changes, seems to have a really significant benefit for whales,” said Jackie Dragon, senior oceans campaigner for Greenpeace. The new, modified lanes are the product of a Coast Guard Port Access Route Study assessing the traffic schemes that direct ships into the region, which includes one of the country’s busiest container ship ports, in Oakland. 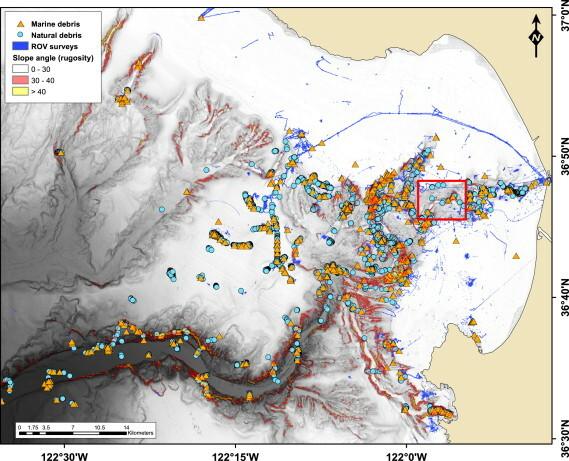 Initiated in 2009, the study was originally motivated by a fatal boat collision two years earlier in the waters north of San Francisco, and the need to make nearshore ship locations a bit more predictable. The accident involved a large cargo ship, the 291-foot-long Eva Danielsen, which struck a small fishing boat, the Buona Madre, about 6 miles off the coast of Point Reyes. Sailing in fog and without a lookout posted or proper safety precautions in place, the container ship’s crew was unaware they’d hit a smaller boat. The Buona Madre — which also failed to take proper safety measures — sank, and its captain drowned. In the wake of the accident, the Coast Guard set out to reexamine maritime safety along the routes leading into the San Francisco Bay. While not initially focused on whales, the study presented an opportunity to make beneficial changes for marine mammals as well. That included weighing input from the public, marine sanctuary councils, conservation groups, and shipping companies, as well as the Joint Working Group on Vessel Strikes and Acoustic Impacts, a panel of experts in the sciences, conservation, shipping, and policy. ”The actual Port Access Route study is, and was designed, first and foremost, to increase safety for mariners and shipping,” said Dragon, one of the working group’s chairs. Created in 2010 by the advisory councils of the Gulf of the Farallones and Cordell Bank National Marine Sanctuaries, the joint working group began to consider how modifications to the area’s shipping lanes could be part of a long-term, multi-pronged strategy to protect local marine mammals. In 2012, the group published a report outlining recommendations for the region. The Coast Guard accepted some of the panel’s recommendations — to extend the western shipping lane, in particular — and in November, the changes were approved by the International Maritime Organization, a United Nations body responsible for regulating international maritime operations [pdf]. Perhaps most important for the whales is a 6-nautical-mile extension to the western lane, which runs through the Gulf of the Farallones National Marine Sanctuary. Until June 1, the lane ended just before it reached the continental shelf drop-off, about 25 miles from shore. There, where the ocean floor plunges to a depth of around 10,000 feet, seasonal nutrient-rich, cold water upwellings fuel explosions of krill and draw endangered fin, humpback, and blue whales to the area. Entering and exiting the western lane meant ships would travel parallel to shore, along the drop-off, and plow through a path littered with feasting whales. For all their enormity, whales are like squirrels on the maritime highway, helpless beneath the bow or rudder of the 100,000-ton ships that call on ports in the San Francisco Bay. In 2009, the western lane became the most highly trafficked of the three routes into the Bay, a result of the California Air Resources Board mandate requiring that ships burn more expensive, cleaner fuels closer to shore. Pointed perpendicularly to the coast, the western approach kept ships offshore for longest. When a bumper crop of krill bloomed in 2010, fishermen reported a florid ocean, teeming with more marine life — and way more whales — than they’d seen in years. That same year, scientists reported a startling number of shipstruck dead whales, found floating offshore, washed up on beaches or dragged into port. One humpback, two fin whales, and two blues – the confirmed toll for the region was higher than in the previous five years, combined. Now, the longer western lane means ships will continue the perpendicular trajectory until they’ve crossed over the shelf drop-off, and away from areas most frequented by whales. In Southern California, lanes leading through the Channel Islands and into the ports of Los Angeles and Long Beach are also being tweaked. They’re being narrowed, and diverted around areas where whales are likely to be. Southern California’s whales have fared no better than their northern cousins of late. In 2007, at least five blue whales were killed by ships in the Santa Barbara Channel – a number high enough for such an endangered species that NOAA declared the deaths an Unusual Mortality Event. In fact, the impact of ship strikes on the 3,000-strong blue whale population has scientists especially worried. “Not only are blue whale populations not very large, but their trend is not recovering as it should be from whaling,” Calambokidis said. Near San Francisco, the Joint Working Group is moving toward the next step in a strategy they hope will ultimately include what are known as Dynamic Management Areas. These are areas where access to shipping lanes is responsive to fluctuating concentrations of whales. If a congregation of whales has settled near one lane, then ships might be advised to avoid that route. Or, if they must use it, they will be told to slow down and use extreme caution. But before that can happen, scientists need to know where the whales are, and whether they can gather enough data to trigger lane restrictions with conservation benefits, said Michael Carver, deputy superintendent for the Cordell Bank National Marine Sanctuary. “Once that is determined, NOAA, the U.S. Coast Guard and the shipping industry will work together,” Carver said. The availability of updated nautical charts that reflect imminent changes to shipping lanes. 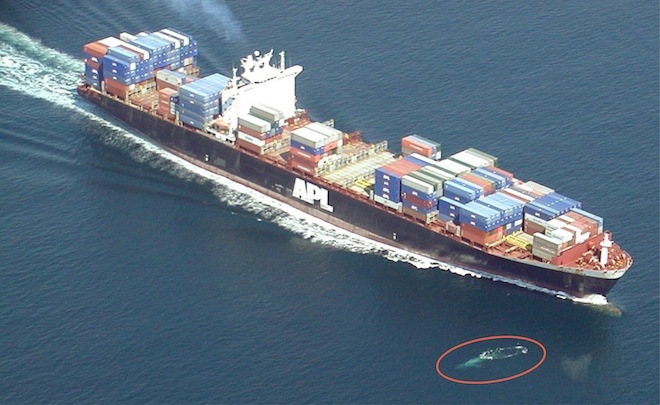 Effective June 1, 2013, the International Maritime Organization (IMO) is amending vessel traffic separation schemes in an effort to enhance navigational safety and to protect endangered whales. 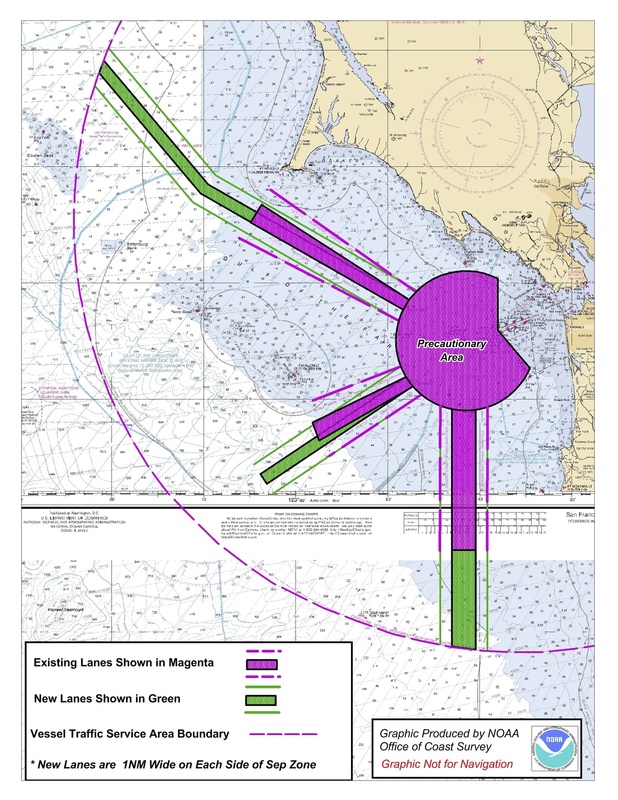 The IMO adjustments to shipping lanes, which are backed by National Oceanic & Atmospheric Administration (NOAA) research, will affect waterways along the California coast, from Long Beach all the way north to San Francisco, including Cordell Bank, Gulf of the Farallones, and Monterey Bay National Marine Sanctuaries, as well as prime commercial fishing grounds. The charts impacted include charts 18724, 18647, 18649, 18728, 18729, 18744, 18725, 18746, 18645, 18721, 18640, 18680, 18700, 18720, 18740 and 18022. A specific update will be done in the next days to include all these changes. An old photo rekindles interest in the search for Amelia Earhart. A grainy sonar image captured off an uninhabited tropical island in the southwestern Pacific republic of Kiribati might represent the remains of the Electra, the two-engine aircraft legendary aviator Amelia Earhart was piloting when she vanished on July 2, 1937 in a record attempt to fly around the world at the equator. Released by The International Group for Historic Aircraft Recovery (TIGHAR), which has long been investigating Earhart's last, fateful flight, the images show an "anomaly" resting at the depth of about 600 feet in the waters off Nikumaroro island, some 350 miles southeast of Earhart's target destination, Howland Island. 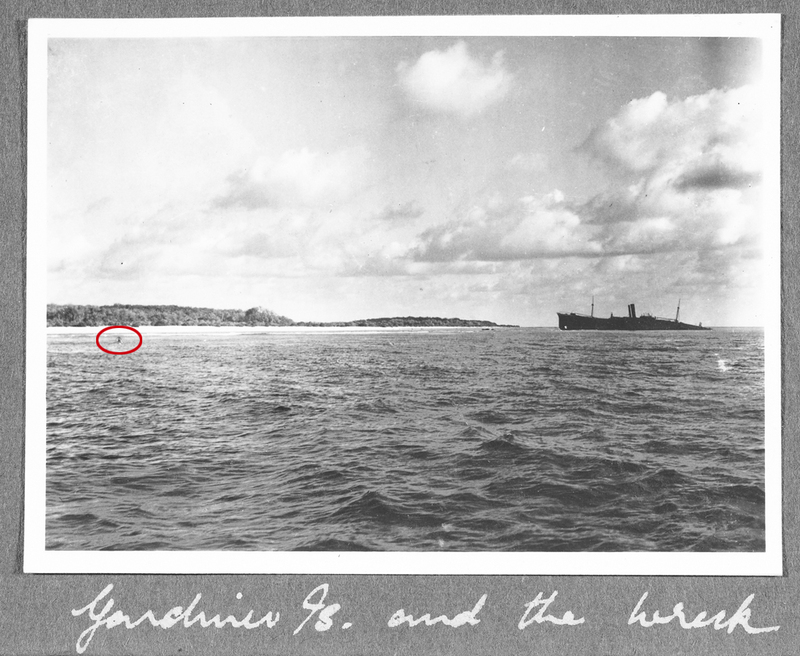 A sonar map created by TIGHAR shows the location of an anomaly (pointed to with a small red arrow, center) that could be the wreckage from Amelia Earhart's plane. According to TIGHAR researchers, the sonar image shows a strong return from a narrow object roughly 22 feet long oriented southwest/northeast on the slope near the base of an underwater cliff. Shadows indicate that the object is higher on the southwest (downhill side). A lesser return extends northeastward for about 131 feet. "What initially got our attention is that there is no other sonar return like it in the entire body of data collected," Ric Gillespie, executive director of TIGHAR, told Discovery News. "It is truly an anomaly, and when you're looking for man-made objects against a natural background, anomalies are good," he added. Gillespie and his team believe the two became castaways and eventually died there. The international Group for Historic Aircraft Recovery claims this newly discovered debris field is offshore from the west end of Nikumaroro, which is where a 1937 photo shows what is believed to be the Lockheed Electra landing gear. NEWS: Pieces of Amelia Earhart's Plane Located? In July 2012, Gillespie and his crew returned to Nikumaroro to carry out an underwater search for the plane with a torpedo-shaped Autonomous Underwater Vehicle (AUV) and a Remote Operated Vehicle (ROV). Multi-beam sonar mounted on the ship mapped the underwater terrain and the AUV collected a volume of side-scan data along roughly 1.3 nautical miles of shoreline off the west end of Nikumaroro, while the ROV, capable of reaching depths of 3,000 feet, produced hours upon hours of high-definition video. Plagued by a number of technical issues and a difficult environment, the hunt did not result in the immediate identification of pieces from Earhart's Lockheed Electra aircraft. As they returned from the data collection trip, TIGHAR researchers began reviewing and analyzing all of new material recovered from the underwater search. They identified a small debris field of objects at the depth of 200 feet, which TIGHAR forensic imaging specialist Jeff Glickman described as consisting of man-made objects. Located distinctly apart from the debris field of the SS Norwich City, a British steamer which went aground on the island's reef in 1929, the site features objects which appear consistent with the interpretation made by Glickmann of a grainy photograph of Nikumaroro's western shoreline. Amelia Earhart also explored the deep ocean. Block Island, July 25th, 1929. The grainy photo was shot by British Colonial Service officer Eric R. Bevington in October 1937, just three months after Amelia's disappearance on July 2, 1937. It revealed an apparent man-made protruding object on the left side of the frame. Forensic imaging analyses of the picture found the mysterious object consistent with the shape and dimensions of the wreckage of landing gear from Earhart's plane. "The Bevington photo shows what appears to be four components of the plane: a strut, a wheel, a worm gear and a fender. In the debris field there appears to be the fender, possibly the wheel and possibly some portions of the strut," Glickman told Discovery News. A new twist in the search occurred last March when Richard Conroy, a member of TIGHAR’s on-line Amelia Earhart Search Forum, spotted an anomaly in a sonar map posted online. NASA image by Jeff Schmaltz, LANCE/EOSDIS Rapid Response. 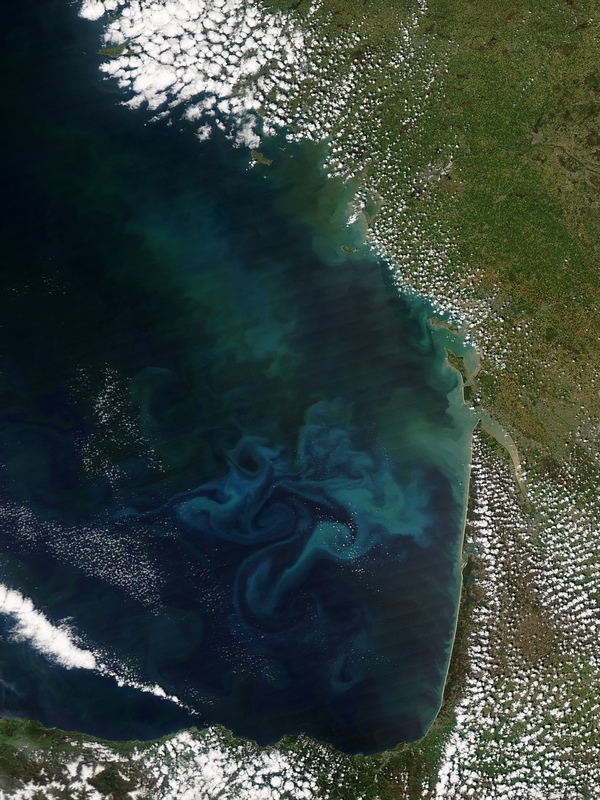 Springtime has brought a substantial and long-lasting bloom of phytoplankton in the Bay of Biscay, off the western coast of France. 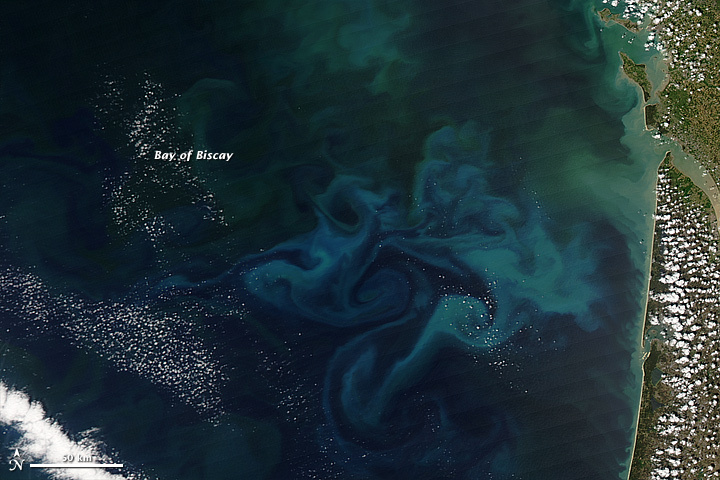 Swirls of green, turquoise, and cyan on the water surface show the location of these microscopic, plant-like organisms, while also tracing the currents and eddies that mix them. 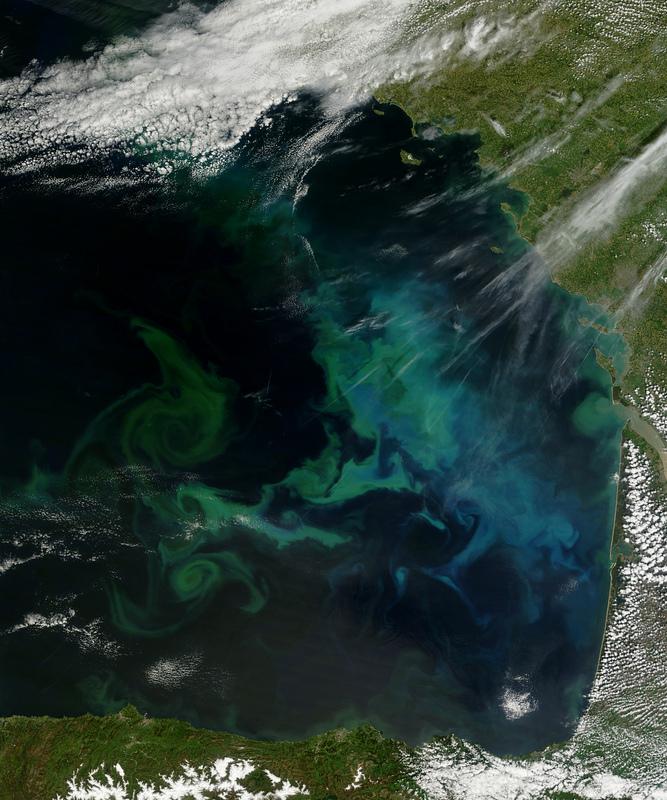 Phytoplankton are always present in the water but the stronger sunlight of the season—as well as pulses of nutrient-rich sediments and fresh water flowing out from the land—promote prodigious blooms that can last for weeks to months. Blooms can be a blessing to other marine species, as these tiny floating plants often feed everything from zooplankton to fish to whales. But some algae and plankton blooms can turn dangerous, either through the production of chemical toxins or by severely depleting the oxygen supply in the ocean and creating “dead zones” that suffocate marine creatures. 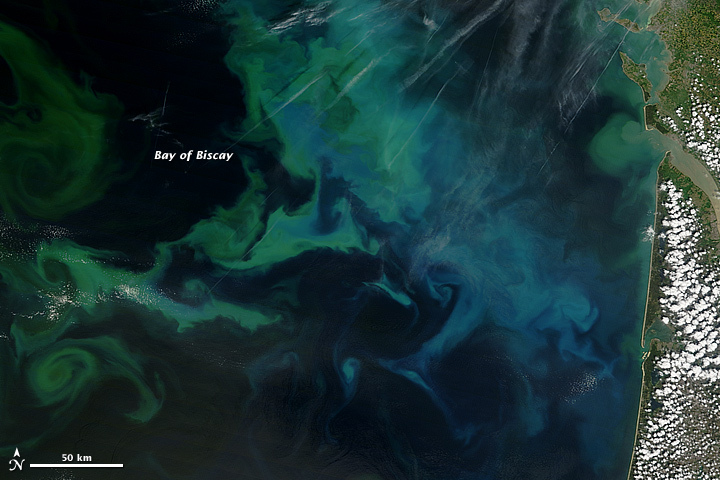 NASA satellites captured these natural-color images of a phytoplankton-filled Bay of Biscay in the spring of 2013. The Moderate Resolution Imaging Spectroradiometer (MODIS) on the Terra satellite captured the top image on May 4. The MODIS instrument on Aqua acquired the bottom image on April 20. A third image of the bloom (April 25) is available by clicking here. Note how the bloom appears to progress further offshore. Such blooms tend to occur every March and April in the area, running out in May as ocean conditions change and surface nutrients run out. The colors of the blooms are mostly derived from the pigments in the phytoplankton, which use chlorophyll to turn sunlight into fuel (photosynthesis); some of the color is also attributable to the minerals in the fine shells of these organisms. Coccolithophores, for example, produce a calcite (limestone) shell that can give the water a milky appearance. To view ongoing conditions in the Bay of Biscay, click here for daily satellite passes. European Space Agency (2005, May 6) Earth from Space: The Bay of Biscay. Accessed May 10, 2013. NASA Earth Observatory (2004, May 18) Bay of Biscay in Bloom.